Here are all the sketches from 0.2.4, and a very long commentary. 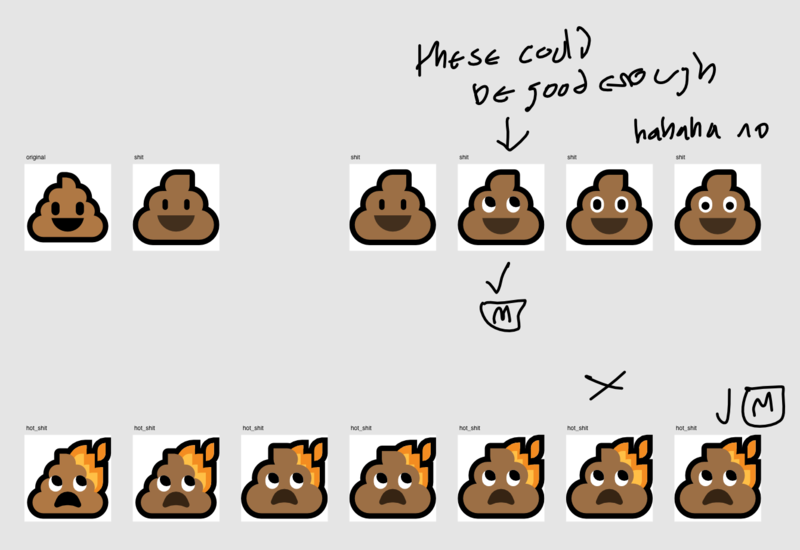 I am now making notes as I’m making the emoji, so giving you commentary is more efficient more detailed, and less scary to post at the end of a version because I have all the content already available. Remember, sketch file names are just the date they were begun, so there will be disjointedness from file to file. Enjoy! This update was a response to a variety of things that I had a problem with and I felt like I finally had developed a variety of design solutions and methods to tackle them. 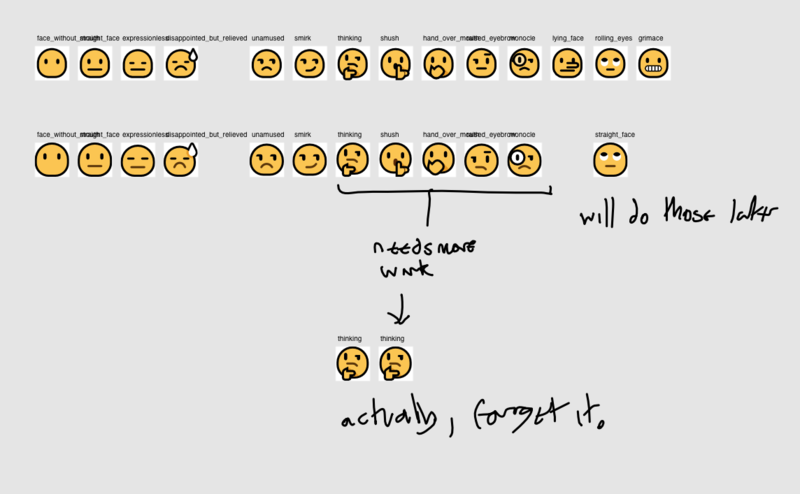 There were a bunch of emoji designs which I didn’t like the implementation or the core idea for. There were also a lot of geometry fixes that were necessary to improve the rendering I couldn’t get round to while I was making them because Affinity Designer can be rather temperamental from version to version. 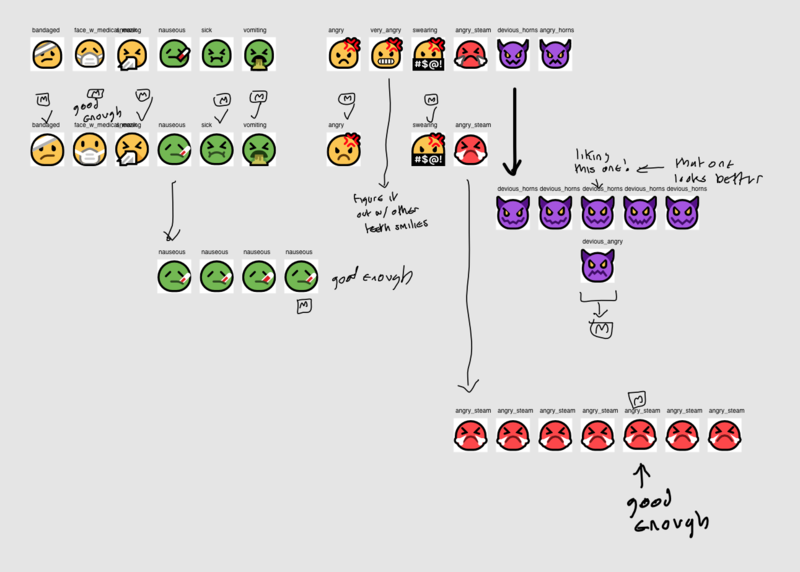 While I love most of the core ideas, the smileys were smaller than they needed to be within the canvas area and the aesthetics and implementations weren’t as good as they could have been. So alongside brushing up a lot of rendering and design bugs, I decided to take on all the smilies and revise their designs. 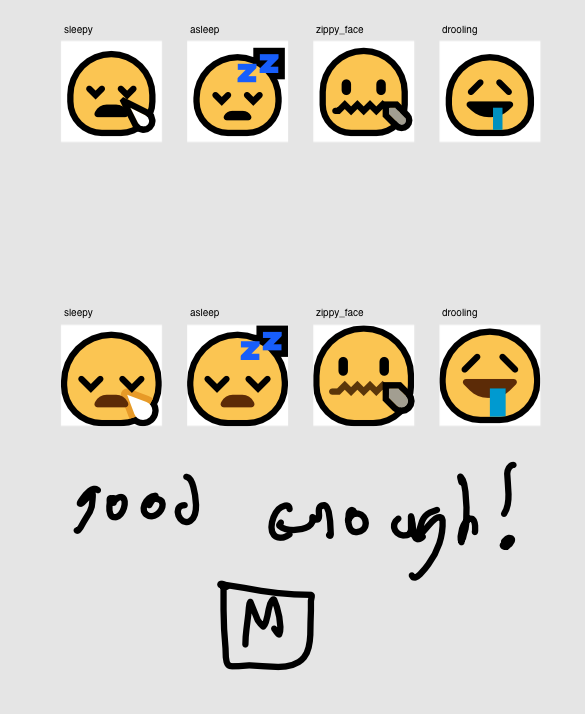 During 0.2.4, I was feeling more invigorated and less in a rut since opening myself to emoji commissions, because I’ve had to take on new design challenges, and I can bring back new-found expertise into Mutant Standard emoji (also my mental health was substantially better during the making of these emoji). 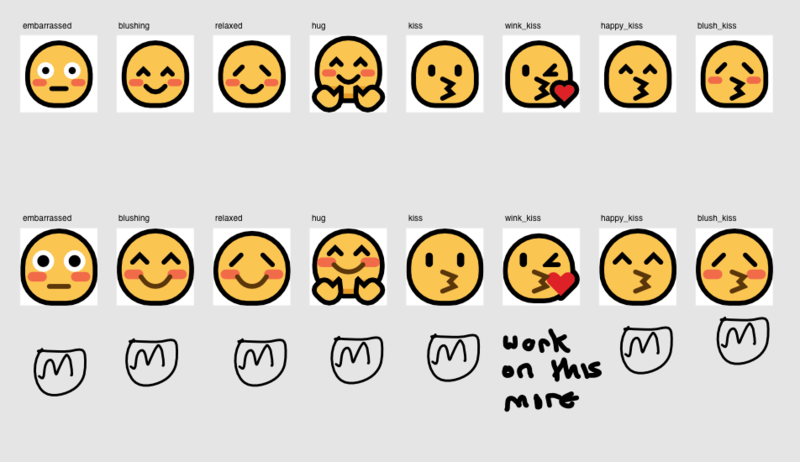 I was more confident and was more comfortable in taking a more rapid approach to making emoji, where I’d jump between designs, instead of grinding on the same design quite intensely for a while (which also came from my commission work practice). Mistakes and accidents played a big role in many of the design changes in this version. 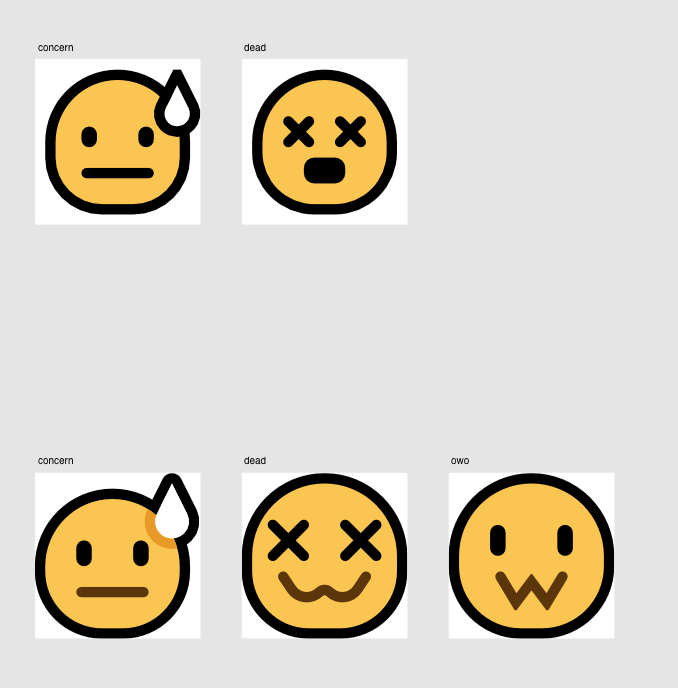 I experimented with rounded exclamation marks in shock-fear-exhaustion emojis and I liked them so I brought them back to very_big_smile, which I put down as being completed earlier. Various small things were fixed after sketches because it was a lot quicker to do than making their own file just for making a quick fix, so you’ll see some variability between what was considered ‘finished’ in the sketch and the actual final result. I wanted to make the confused swirls more prominent and feel less like a part of the face so to speak (making the lines black makes them feel more grounded and set in the face, instead of an extension of that smiley’s expressions). 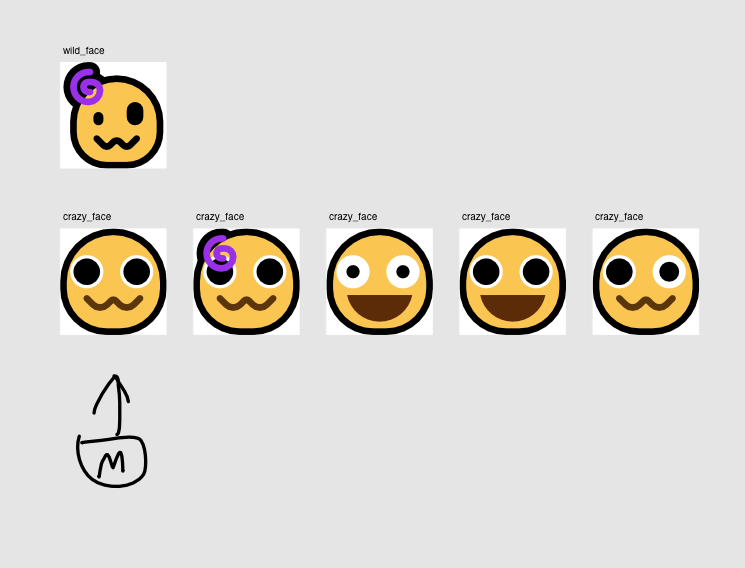 You’ll also see a similar philosophy with how the smiley mouths have changed from being black to a dark shade of yellow (to distance themselves visually from the eyes and make the smilies look less flat). The starting point for where I decided to redo all of the smilies. As you can see on the top left, I experimented with a variety of methods of drawing the corner-pieces to an expression (the exclamation mark and forehead sweat drop). I settled on a new rendering technique, which used subtle darker outline to differentiate white objects from the smiley yellow colour so they didn’t need a black outline. The old teeth were not that popular among my friends (and I can kinda understand why), and they didn’t scale well, so I needed another abstraction method to convey teeth. Drawing good teeth that scaled well to extreme differences in resolution was quite a big challenge, but I’m happy with what I came up with in the end, it does all of the things I wanted it to! These were mostly just expanded versions of the originals. I really liked how I did nearly all of these in the originals and I didn’t want to fundamentally change them. I tried a variety of ideas here, often influenced by what other vendors were doing, but in the end, I opted for something quite divergent. I did this because I felt it communicated the idea in a uniquely appropriate way and one that suited the aesthetic of the project/set very well. 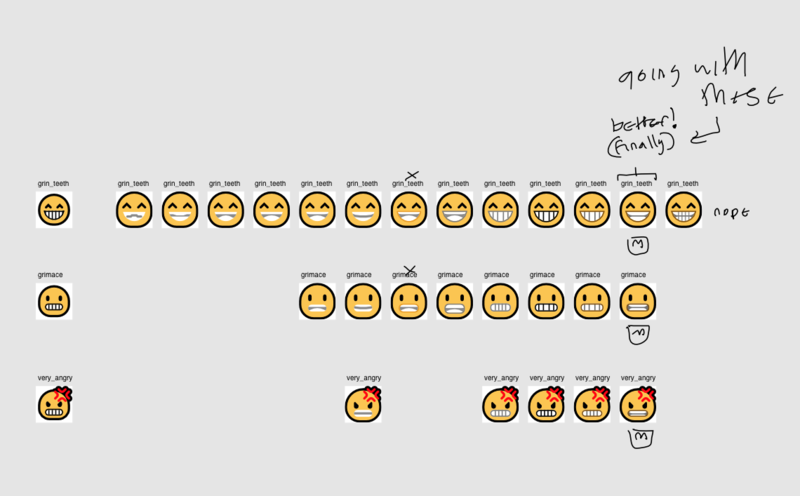 The main inspiration for the final design came from an amusing accident when making an emoji commission for someone. 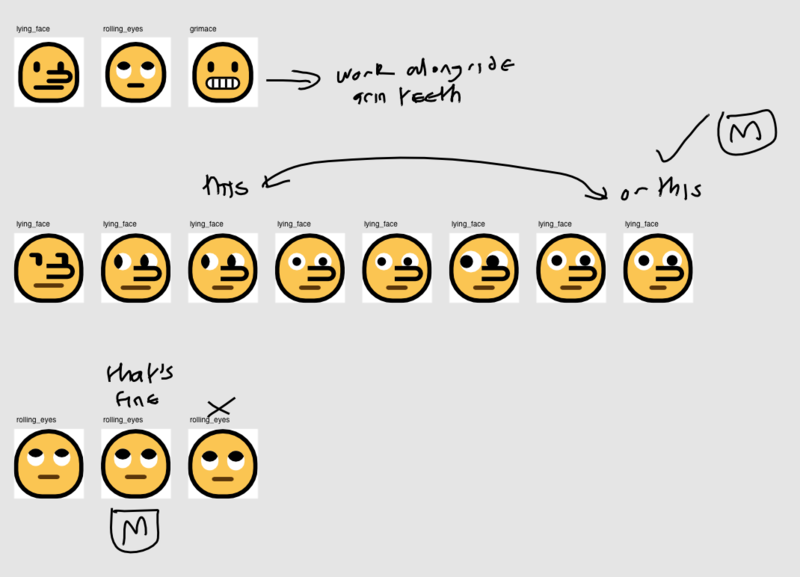 It also fits better into a running theme of Mutant Standard smilies (which is in contrast to other sets I’ve seen) – when a smiley is overwhelmed or confounded, the expression is usually quiet and inward-focused rather than outward. I realised I wanted to make the lying face look like someone who was caught in the act of lying, rather than simply their nose getting bigger and them seeming puzzled or disappointed. So I combined elements of the embarrassed face into this. I also went over the rolling eyes face in this file. Notice how I try to remove as many unnecessary internal black lines as much as possible, like on the beads of sweat and on exclamation marks (that was developed from an earlier sketch in this blog post). From personal experience, the old internal black lines often made things feel too dull and dark and made the emoji look aesthetically work at smaller sizes, so it was that sitting around with the designs long enough that enabled me to detect design problems like those. Continuing with the theme of inward-facing expressions if a smiley is overwhelmed, the dead smiley’s mouth has been changed from an open mouth to a Nirvana-esque closed expression. 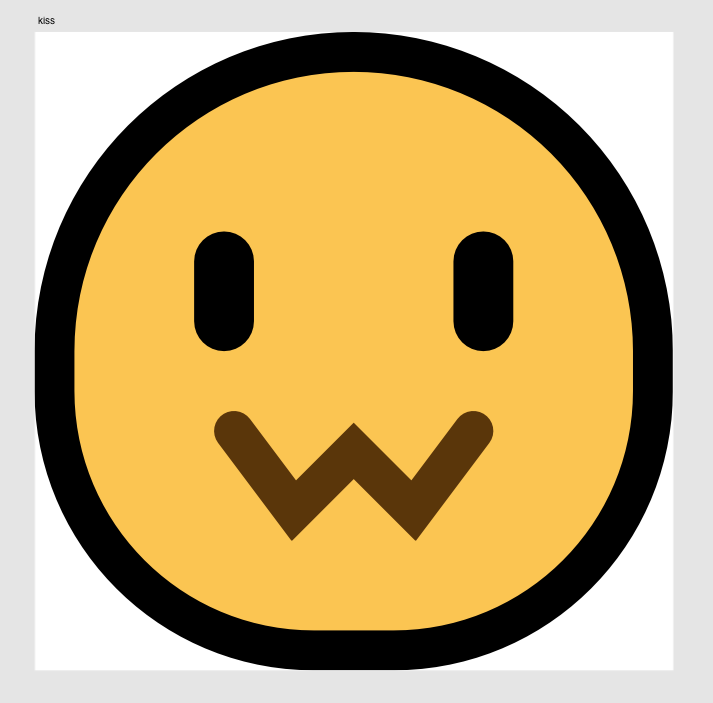 owo (later renamed to soft ) will be mentioned a bit later in this blog post. I decided to make the smiles bigger on many of these, to convey a bit more outward-facing warmth. This custom smiley face (later called soft) resulted from making the kiss face mouth, because I initially constructed the lines at a 90˚ angle from what it normally is before rotating it, resulting in the face you see above, and I realised that I should probably spin that off into it’s own thing because I know a lot of people would appreciate it. I’m still not that happy with the laughing smiley, but I ran out of ideas at that point, and this was still an improvement over the original. 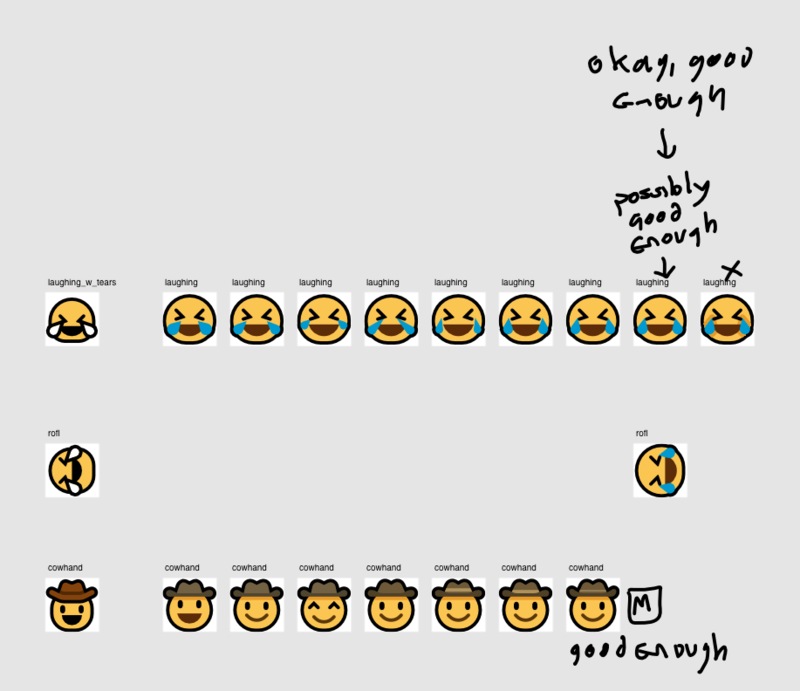 The cowboy (which was long an emoji design I took issue with) is nice and I think it’s pretty great now! Another thing that’s different compared to other vendors is that these emoji look more like cats and have more cat-like mouths in many ways. I was initially concerned that this idea wasn’t going to work because I’ve never really done light-on-dark designs like this before, but I’m pretty happy with how they turned out, and the response to them has been really great. When it came to make the orange heart, I felt that it wasn’t enough to just make the heart and leave it at that. I really wanted to improve the shading. Inspired by what I thought were very successful shading techniques in various emoji like the cloud and water droplet emoji (pictured above), I wanted to give the hearts the same treatment. It took a bunch of attempts, but I’m really happy with the feeling of depth and the unique aesthetic feel of these. 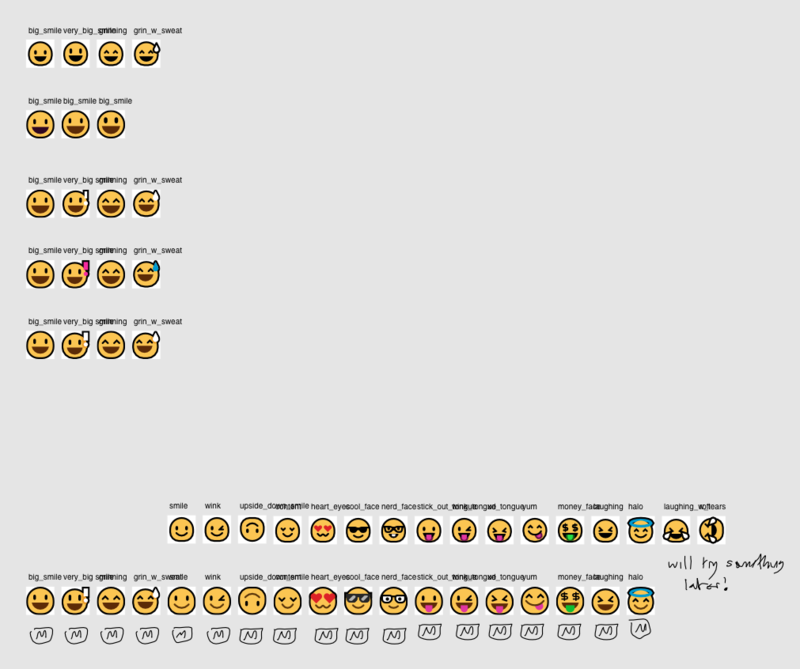 Based on the continued success of this method, this shading method will eventually extend to most/all emoji like these. I realised that the anatomy of this expression was faulty (plus the emoji didn’t take up as much of the canvas as it should), so it was fixed.